Copper price has dropped in recent months after the tariffs kicked in. A stock market is obviously worried that China as a top copper consumer will face a decreased growth and thus, a lower demand. However, the industry analysts believe that China’s demand will remain strong. On the other hand, there have been quite a few of supply disruptions such as strikes in the mines among the top copper producing countries. Such elements send the price higher. Copper price is highly sensitive to supply and demand dynamics and thus, in quite uncertain times as we have entered this year, the price may become pretty volatile. I have released an article “how to invest in copper” in February, where all the dynamics and important factors are described. I have also depicted the price of copper in the three major channels that the price has been following for last three years. Now we can see how the trend channels really hold and how important the particular trend lines are. In August last year, the copper managed to break up from the central channel. 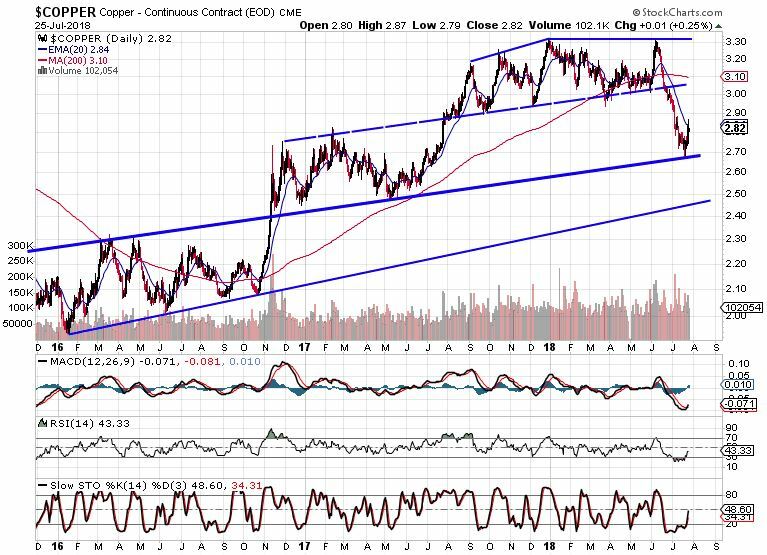 Copper at these levels let copper miners profit much better than before. That is why for instance Southern Copper Corporation (SCCO) pierced through a 7-year long resistance. As the demand worries appeared, the price of copper didn’t hold its support of 3.05 and dropped sharply landing on the current support (wide blue line) of about 2.70. I don’t know whether demand is going to be strong in China as they claim or not. I guess this is in the hands of the clever people who are going to negotiate the world trade and arrange the world economic growth afterward. What I know is, that the above trend levels hold so far and while the copper prices move within the current trend channel, the copper miners are able to produce profit what is then reflected on their earnings. Therefore, if applying your trading strategy well, you can still make money on trading copper mining companies out there. PreviousPrevious post:Market Review Update – S&P 500, Dow, Nasdaq, FTSE 100 – Week #30NextNext post:Why Are Marijuana Stocks Dropping?